Welcome to week 19 of 50 Women Game Changers in Food. This week we honor another fellow food blogger. Pim Techamaunvit started writing about her adventures with food; what she cooked, what and where she ate. Her blog Chez PIm became so popular it landed her a book deal, The Foodie Handbook. 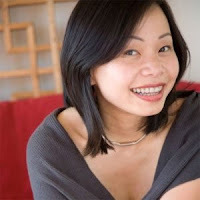 She has written articles for several magazines and newspapers and has even been a guest judge on the Food Network's Iron Chef. As I browsed through her blog trying to decide which dish to make I came across "Pad Thai for Beginners." This would be my first time making a Thai dish. However, I was a little nervous because my daughter and husband really enjoy Pad Thai when we eat out, so what would they think of mine? I made it with chicken and left out the tofu. The results...everyone had seconds, including the boys! There were no leftovers...what a compliment! Do not get overwhelmed by the length of the recipe it is very detailed with information about the ingredients, several options for substitutions, cookware and wine pairing. PAD THAI FOR BEGINNERS Adapted from Chez PIm. To make about two cups of sauce, you should begin with about ½ cup each of Tamarind (*see the note below for how to prepare tamarind pulp), Fish Sauce, and Palm Sugar. If you substitute white and/or brown sugar for the Palm Sugar, you should use only about 1/3 cup. Melt all these together in a small pot over a low flame. Taste and adjust the flavor balance until it suits you. Then add the chilli powder, begin with a teaspoon or two, depending on your taste, and keep adding until it tastes the way you like it. By the time you’re done flavoring the pot should be simmering happily. Turn off the heat and let the sauce rest while you get to the other ingredients. Here’s a list of what you need, and the quantity to use per portion. Thin rice noodle, also called Rice Sticks, Banh Pho, or Chantaboon. You can buy Rice Stick noodles at your local Asian supermarket or get them online. Soak them . Don’t soak until the noodle is soft enough to eat, or it will turn into mush in the wok. Just do it until it’s pliable and almost edile, like very al dente pasta, then drain well. You will need about 1-2 loosely packed cups per portion, depending on how carb-happy you are. You can use more or less, entirely up to you and your friends. A 500g (or about 16oz) bag of dried noodles should be enough for 6-8 portions. Buy a little extra just to be sure. It’s cheap and, if left unsoaked, will last just about forever. If you can find fresh rice noodle at your market, depending on the freshness, you might want to soak it anyway just to soften it a bit more. Follow the same step as the dried noodle but do not soak for as long. One normal bag of fresh noodle, usually around 500g, will be enough for 3-4 portions. The cheaper versions of Pad Thai on the streets of Bangkok are made with only tiny dried shrimps and no fresh ones at all. I don’t want to go that far, but I still like to add a bit of these salty dried shrimps for extra flavor -you can easily skip it altogether. I take a bit of dried shrimp and pound in a stone mortar and pestle until fluffy. It’s important to use the mortar here and not your cuisinart, which will turn to dried shrimp into hard, dried chunks (entirely capable of cracking a tooth) instead of fluffy bits of salty shrimp. I use about 1-2 tablespoon per portion. I like to use a little bit of garlic in each portion, give it an extra kick. You don’t have to. While you’re savoring your champagne, let me tell you a bit about that temperamental beast that’s your well-seasoned wok (**see note below). The success of your Pad Thai depends on it. A wok is not built for heat retention or long and even cooking, unlike Western style pots and pans. A Le Creuset pot, for example, is built like a marathon runner, slow to warm up but has a long staying power. A wok, on the other hand, is more like a sprinter. It heats up really fast, and loses it just as quickly. The thin iron steel material in a good wok transfers more or less all the heat from the flame directly to the content inside. This is great for the ability to control heat, you can turn the fire up and down and the heat in the pan will rise and fall just as quickly. This also means that a wok can sear and cook a small amount of food lightening fast. Adding too much all at once and letting the heat escape would turn a wok into a useless piece of tin in a blink of an eye. And since the caramelization and charring from a hot wok is where the wok-flavor, or wok-breath as some call it, comes from, your utmost goal in wok-cooking is to start out hot and keep it hot! Make sure that all your ingredients are at room temperature, and that you add them in sequence and let the wok reheat back up before each addition. At no time should you add a huge amount of ingredients all at once, unless you want a Pad Thai stew. Follow these steps carefully and the best Pad Thai you’ve ever had will be the one you’ve just made! Keep the sauce pot warm on another burner next to your wok. Keep a bowl of water handy too, if things get to hot in the wok you can sprinkle the water on it to slow it down. Add a splash of oil, about 3-4 tablespoons. Don’t be shy, this ain’t no diet food. If you are making chicken Pad Thai, add the chicken first, cook, stirring vigorously, until it’s half way done, about 1-2 minutes, then add the tofu, a tablespoon or two of the sauce to flavor the chicken, and a pinch of garlic if you’re using it. If you are making tofu or shrimp and tofu Pad Thai, then only add the tofu (and garlic) for now. Cook for another minute until the tofu is crisp and slightly brown at the edges. Add the noodle, about 2 loosely packed cups for one portion is my standard, and then a ladle (about ¼ cup) of warm sauce. Stir rigorously, keep everything moving in the wok, and cook the noodle until soft. Remember to break up the noodle and don’t let it lump together. If the sauce evaporates too quickly and your noodle isn’t quite ready, sprinkle a bit of water and keep stirring. Add a bit of oil if the noodle still stubbornly sticks together. As I said, this ain’t no diet food. When the shrimps are done, shouldn’t take more than a minute, add a handful of Garlic Chives. Turn the heat off, and quickly give the wok a good stirring to mix everything together. As soon as it heats back up to a smoking point, you’re ready to do another portion. Repeat this process until all your dinner guests are fed. Keep them lubricated and happy with ample supply of Riesling, Champagne, and/or beer while they wait. That’s how I do it! I saw that recipe in her book. I'm going to have to try it since I love this dish. Thanks for telling us it is not as complicated as the lenght of the recipe might suggest! This looks so delicious...you did a great job on this one. I really don't know much about Pim, I will have to check her out! I have been away so I have missed a few posts. Looking forward to starting up again. I'm so glad you made this dish to celebrate Pim - I've made Pad Thai, but the instructions were so detailed, I decided to go with something simpler. Chicken Pad Thai is like Thailand's version of Parmigiana and Chicken Fillet. I love both dishes.